May 2018 www.coalage.com 43 suppliers news continued well as the power generation market, Task- er explained. "We are competing with a premium product, not on pricing, and our sales have grown 30% year-on-year." As an example, the mines do not have to operate Tier 4 Final engines under- ground, but Sandvik has been installing these engines on its LHDs. Operating a Tier 4 Final engine, however, improves the over- all health and safety for the miners working in a confined environment with that en- gine and it eases ventilation requirements, which in turn reduces the electrical costs for the mine and helps them comply with various regulations related to ventilation. "The use of these engines underground proves they are robust and they perform well," Tasker said. "Yes, we can get diesel exhaust fluid to remote locations and its use underground is not an issue." 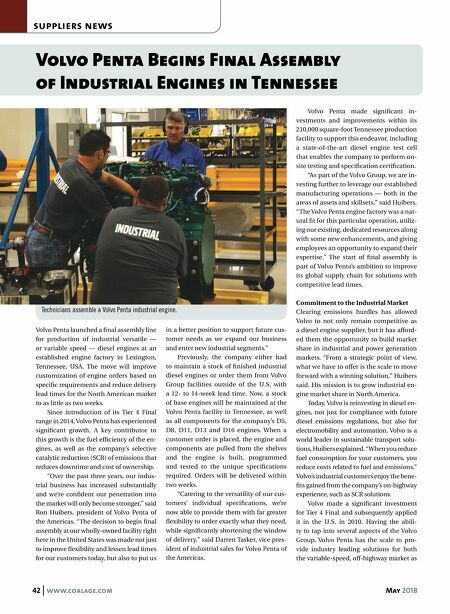 Volvo Penta has a comprehensive line of Tier 4 Final industrial engines. The five engines range from a 5-liter (l), 140-horse- power (hp) unit to a 16-l, 690-hp unit. "We try to keep the exhaust gas recirculation (EGR) to a minimum and that's import- ant," Tasker said. "Massive EGR systems require large cooling systems and radi- ators take up a lot of space. Our custom- ers want to keep their machines compact and they want the engines to be easily in- stalled. They also want a dependable after- market network for service and support." Volvo Penta is working with its customers to build that network. Gradall Industries is an equipment sup- plier that now uses Volvo Penta engines. "In the past, when our customers had a prob- lem with their equipment, they would have to talk to our dealer about the machine and another dealer for the engine," said Mike Norman, director, sales and market- ing for Gradall Industries. "Volvo Penta has brought the Gradall dealers on as service centers and they are now a one-stop shop." Echoing those sentiments, Dan Vita, vice president of the power division for Southwest Products (SWP), said they were also working with Volvo Penta to establish a dealer network, which also supports its line of pumps and gen-sets. "Volvo Penta has made this easy," Vita said. "You're working with a great group of people who are very knowledgeable about the industrial mar- ket. They are passionate about the industry and we never get the feeling that Volvo Con- struction Equipment takes priority over our dealer network." SWP does distribute other diesel engines, but Vita said the company's entire Tier 4 Final line of gen-sets has been transferred to Volvo Penta. Today, Volvo employs 15,000 people at nine production facilities in North Amer- ica. 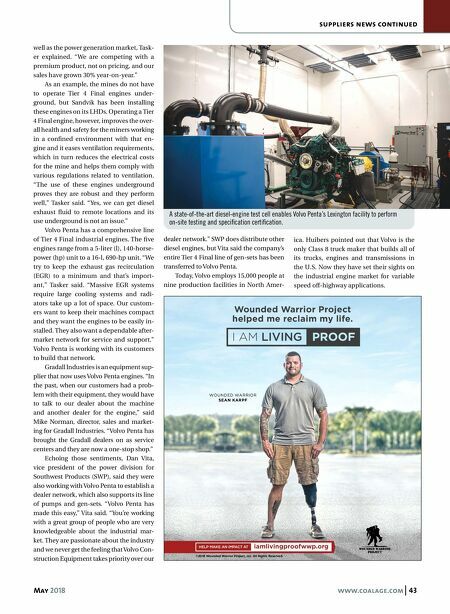 Huibers pointed out that Volvo is the only Class 8 truck maker that builds all of its trucks, engines and transmissions in the U.S. Now they have set their sights on the industrial engine market for variable speed off-highway applications. Wounded Warrior Project helped me reclaim my life. WOUNDED WARRIOR SEAN KARPF HELP MAKE AN IMPACT AT iamlivingproofwwp.org ©2018 Wounded Warrior Project, Inc. All Rights Reserved. A state-of-the-art diesel-engine test cell enables Volvo Penta's Lexington facility to perform on-site testing and specification certification.